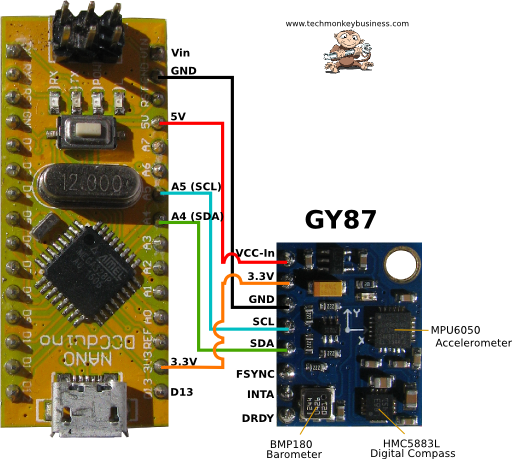 I am intending to use a GY87 board on my Homebuilt VR system. This is a 10 degree of freedom device which incorporates an MPU6050 accelerometer and gyro chip, an HMC5883L digital compass, and a BMP180 barometer. These are all common chips and there is plenty of code around for each of them. In the first instance I wanted to test that sensors reported something useful and combine this into a single sketch. I quickly discovered that the HMC5883L was not reporting and would not even appear in any i2c port scans that I carried out. It appears that the MPU6050 somehow blocks the HMC5883L. Thanks to the work of pistolero992000 on the Arduino forum who worked through the issue and described the solution. 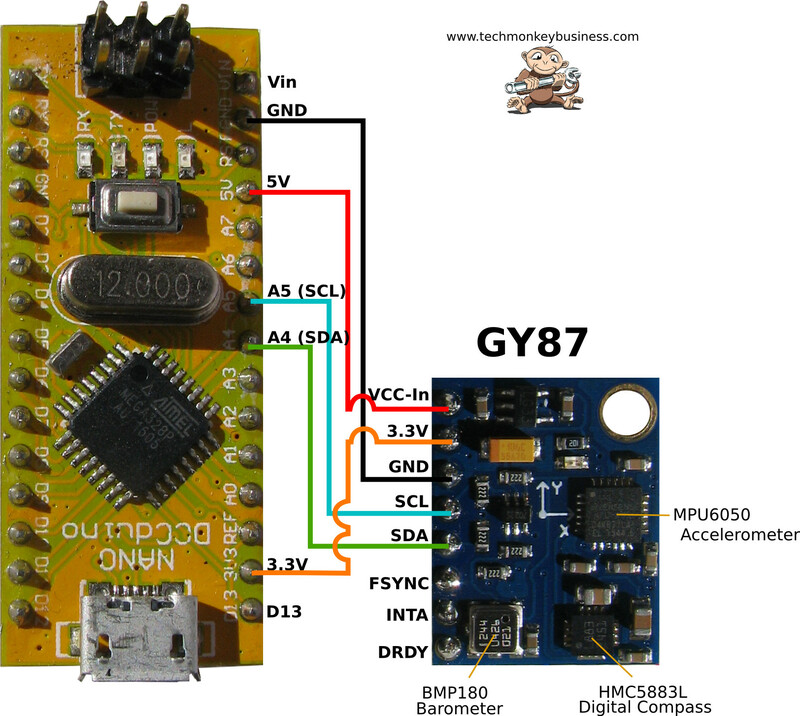 This page brings together a number of sketches for each of the sensors on the GY87 board into one sketch, adds the fix for the HMC5883L, and writes the data output to the Serial. I cannot lay claim to any of the original coding because it really has been an exercise in copying and pasting it all together from the work of others. MPU6050, i2cdevlib, and HMC5883L libraries from Jeff Rowberg. I developed this with Arduino IDE 1.6.8. Some of the older versions cannot handle these libraries. Here is the Arduino Code. The output is a tab separated list on the serial monitor. Because there is so much data the list gets a little ugly and so you will probably want to widen your Serial monitor window as much as you can to accommodate it all. The data from the accelerometer and gyros is in a raw form and would require further processing to get angles as an output. In Jeff Rowberg's example for the MPU6050 he gives the option of a binary output. This is faster, but not human readable. Depending on lag in the system when the VR system is running, it may be necessary to use the binary output directly for the sake of speed. We'll see about that when I get there. Connections are through the i2c bus. GND, 5V and 3.3V connections also present. so you will need to stretch your Serial monitor window to accommodate it. #include <BMP180.h>  //Library for the BMP180 barometer. int x,y,z; //triple axis data from HMC5883L. accelgyro.setI2CBypassEnabled(true);  //This sets the bypass so the HMC5883L gets a look in. // We check to see if we can connect to the BMP180 sensor. // Retrieve the current altitude (in meters). Current Sea Level Pressure is required for this. // Retrieve the current temperature in degrees celcius.